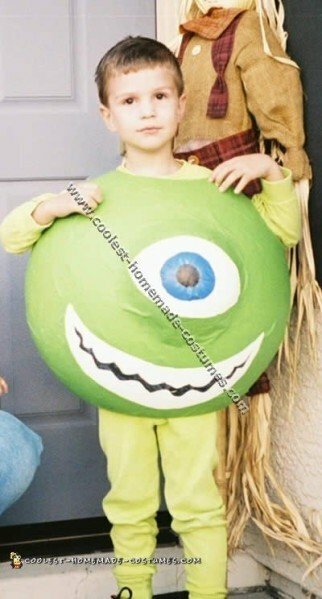 My son loves Monsters Inc and he wanted a Monster Inc. costume so he decided to be Mike Wazowski for Halloween. To make Mike’s body I used a large air-filled rubber ball that I got at Wal-Mart for less than two dollars. To create the eye I duct taped a Styrofoam ball cut in half to the rubber ball. I found the Styrofoam ball at a craft store and cut it with a bread knife. Then I covered ball including the Styrofoam “eye” with paper mache. I used a lot of newspaper and glue until there was no longer any give when I pushed on the ball. I paper mached for days. After the paper mache dried I popped the ball with a steak knife and cut the hole for my sons head, arms and body with a small saw. Then I painted it with craft paint and dyed a pair of long johns green to match. The costume was time consuming but a lot of fun to make and it was a big hit.